One of the most common hurdles my clients face when trying to reach their health and wellness goals is traveling for work. 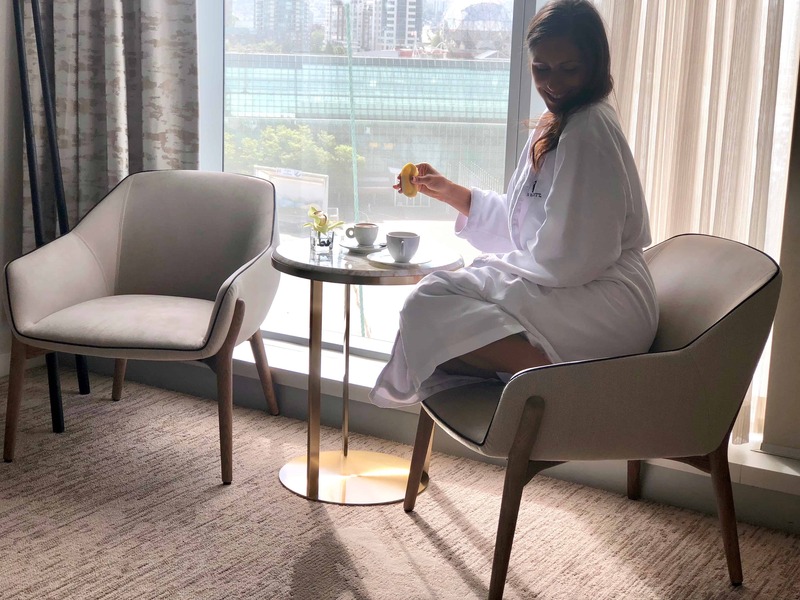 Most of the time, it’s not the flights or long conference days, it’s the unhealthy meals and lack of exercise that accompanies their accommodation. Having traveled quite a bit myself, I can completely understand their struggles. 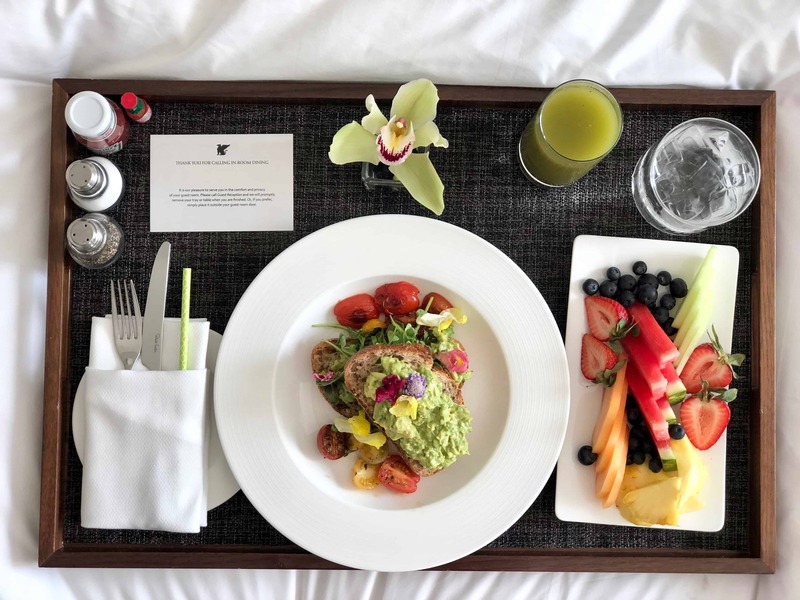 Searching for a healthy item on the in-room dining menu is like asking your butcher where you can find the best tempeh. Good luck. After choosing your item and making the necessary the 12 adjustments it needs to become a ‘clean’ dish, you end up with a deconstructed head of iceberg lettuce with a side of bottled lemon juice. After a long day of work away from home, you’re more likely to toss in the embroidered cotton towel and say ‘screw it’ I’ll take the mac and cheese. 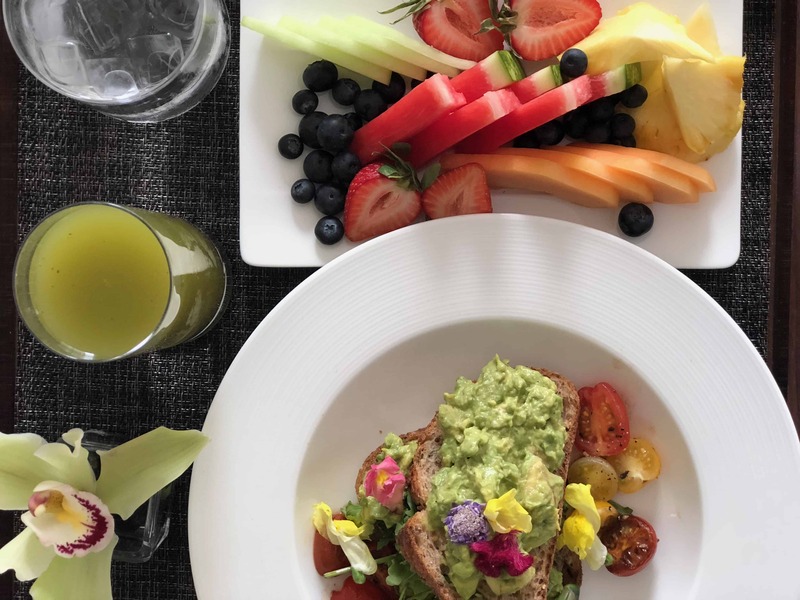 Eating clean and staying active is incredibly important while traveling not just for your overall health but for your job too. Long days of networking and constantly having to be ‘on’ requires a ton of energy, to say the least. 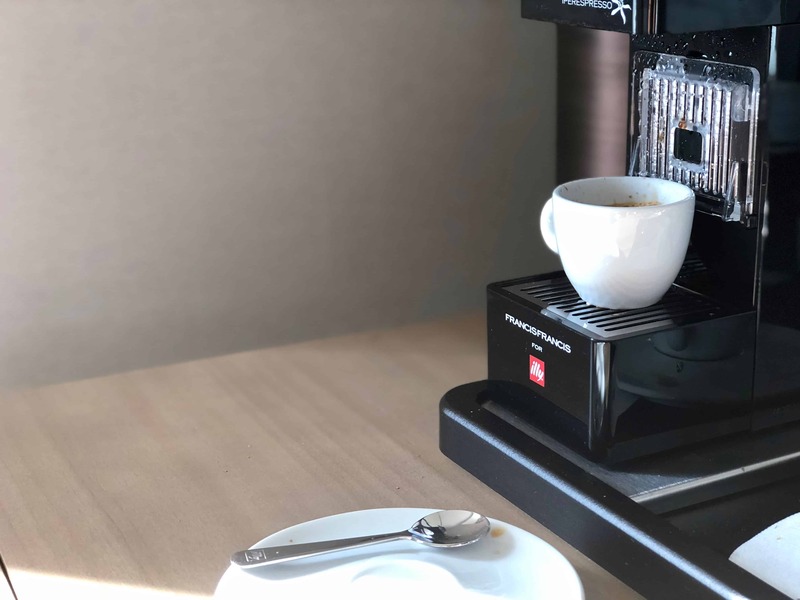 Diet and exercise play an important role in keeping your energy up and your brain sharp so you can network, keep on top of your workload, and are be able to crack witty jokes catching the attention of all the big leagues in the room and their bosses. 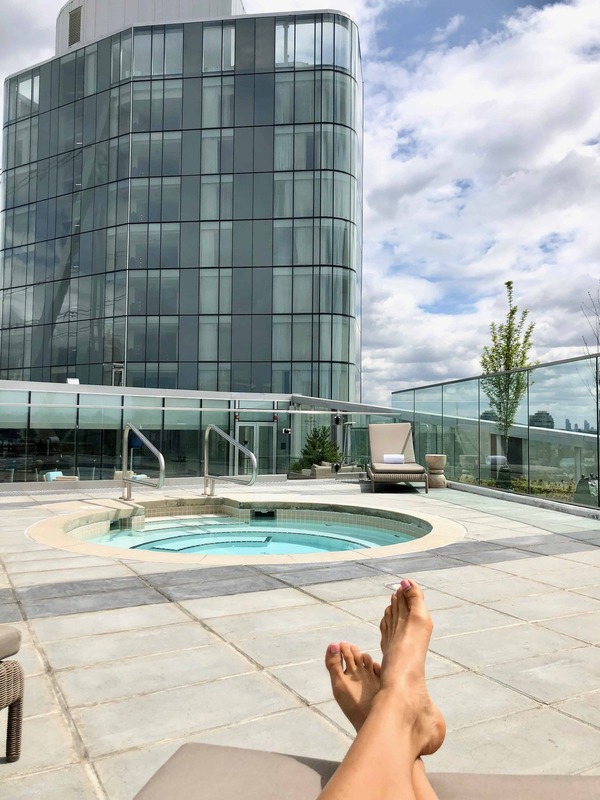 So when JW Marriott Parq Vancouver invited me to stay at their new location and check out their health and wellness facilities, I jumped at the opportunity. But he did gather my belongings and wheel them past the rotating doors into this eden of a hotel. The aroma from breathtaking, enormous arrangements of flowers filled the lobby and transported me out of the city and into full vacation mode. 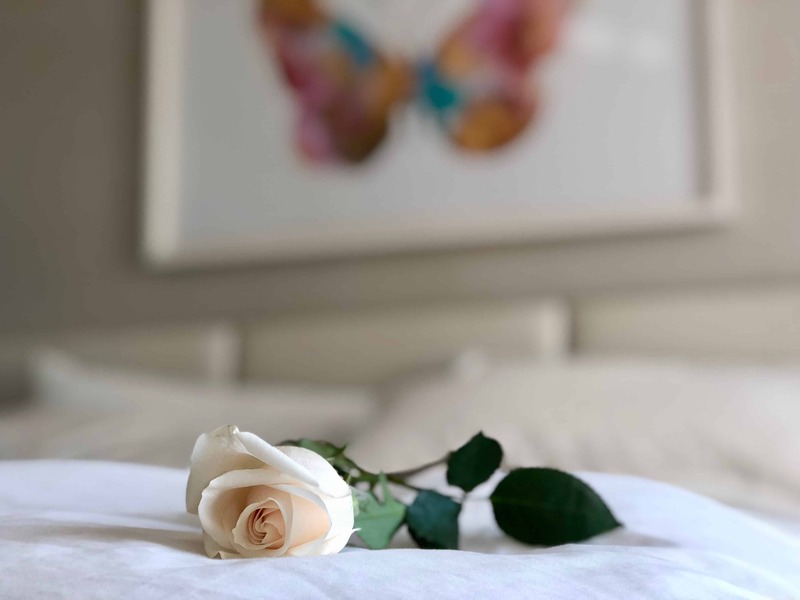 The seamless check-in and receptionist who walked from behind their desk to personally hand me the room key and welcome me into the hotel rekindled my faith for outstanding customer service. Their world-class customer care was confirmed again when I stepped outside of my room holding an ice bucket as an employee walked by and took on the task of filling it for me with no hesitation at all. OK, Parq. 10/10 on aesthetics and customer service. I’ll give you that but how do you hold up when it comes to health and wellness? 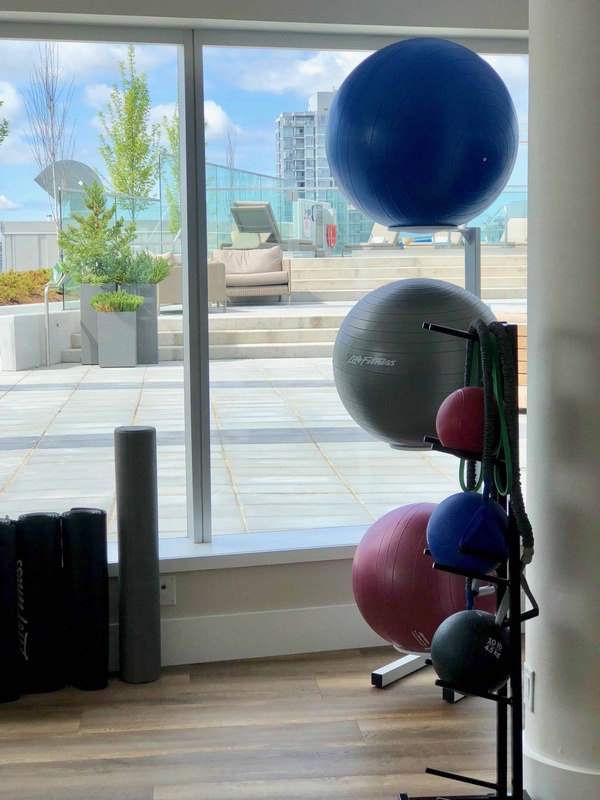 I quickly changed and headed up to the rooftop to check out Parq’s fitness & wellness center. I could practically hear the angels singing as the elevator doors opened and I stepped into the heaven of all hotel fitness facilities. I gathered my jaw off the hotel floor and headed into the gym. 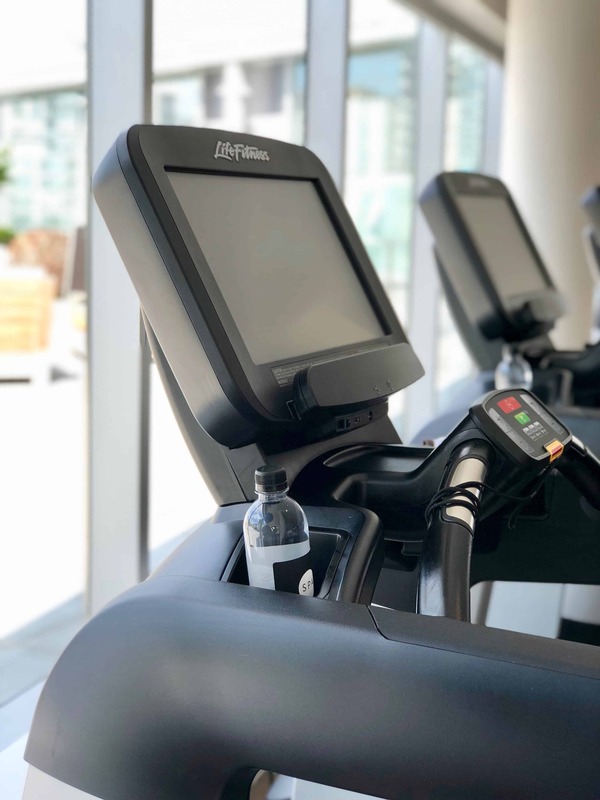 They had covered everything…..Would you prefer to run on the treadmill overlooking the city or the pool deck? Or perhaps you’re like me and switch halfway through. Feeling thirsty? Just look down, there are water bottles placed on every cardio machine. Big recycling guy? Top up your bottle at the refill station by the fruit, complimentary headphones, and fresh towels. Don’t sweat about missing the game, the machines are strategically placed beside the big screen TV’s so you can get your pump on without missing a second of the match. Save rest day for when you return home. 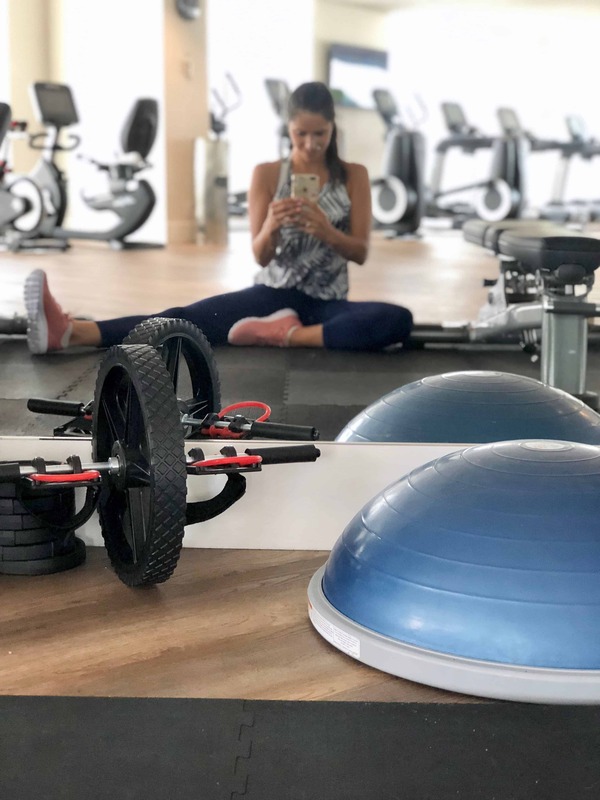 One look at this facility will be all the motivation you’ll need to stay on top of your fitness regime after a long work or travel day. After one of the most motivating workouts of my life, how could you not in a facility like that? I stepped outside onto the top deck and into the hot tub. Now the toughest decision of the day thus far, which lounger to choose and which view to face? Sparkling waters of False Creek or city and mountain view? I’ll take both, please. I sat back and began to brainstorm how I could apply for my residency here. My stomach growled and I knew I had about 20 minutes until full-fledged ‘hangry-ness’ took over. Back in the room, I took a deep breath as I opened the in-room dining menu, preparing myself for the Where’s Waldo of searches for a healthy item. When a plant-based person opens a menu, we look for 1 thing and 1 thing only. A singular small letter in the shape of a V which tells us it’s all going to be OK. We’ll live to see another day. 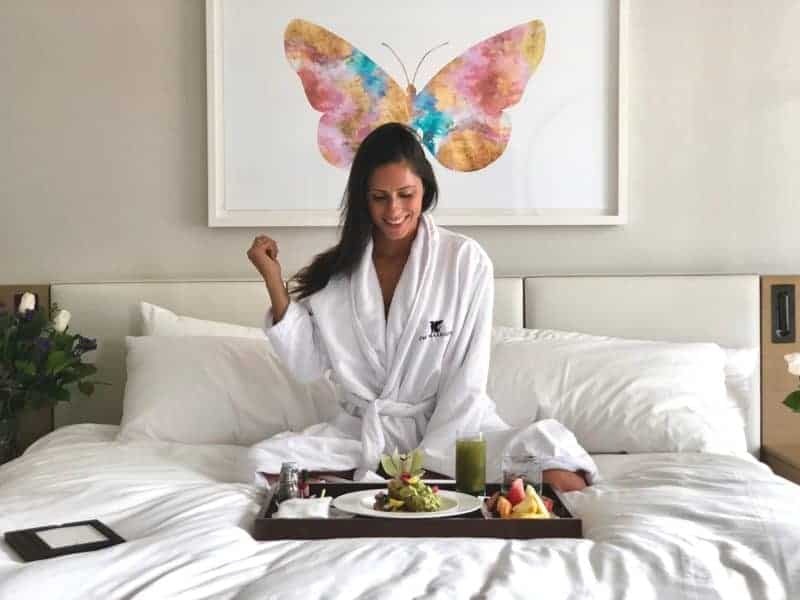 Normally we’re lucky to find 1, maybe 2 but this room service menu had them sprinkled throughout like a little vegan fairy had flown over the and blessed the food card. I actually had choices. Oh, snap, a new challenge. Now I had to pick one! I rang the restaurant and within 30 minutes I had a delicious, clean, plant-based meal at my door. No alterations needed. 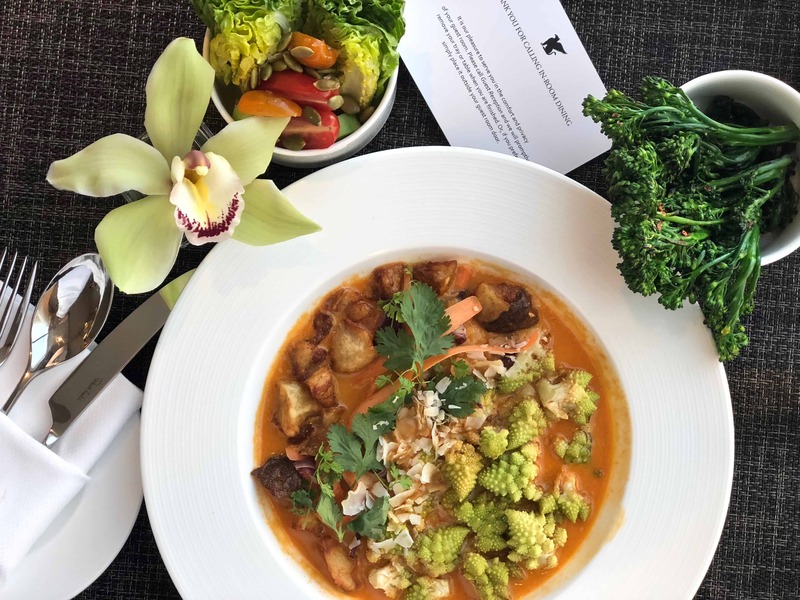 I’m not food critique, but I can tell you the cauliflower dish with a side of broccolini and vegan wedge salad not only the best in-room item I’d ever had but was up there alongside some of the renown specialty vegan restaurants I’ve enjoyed around Vancouver. had heard amazing things about the multiple lounges and restaurants throughout the hotel. I had a workout under my belt, was replenished, and now it was time to explore. We chose the patio at D/6 Bar & Lounge which had both Marc and I pinching ourselves. We’re still in Vancouver right? 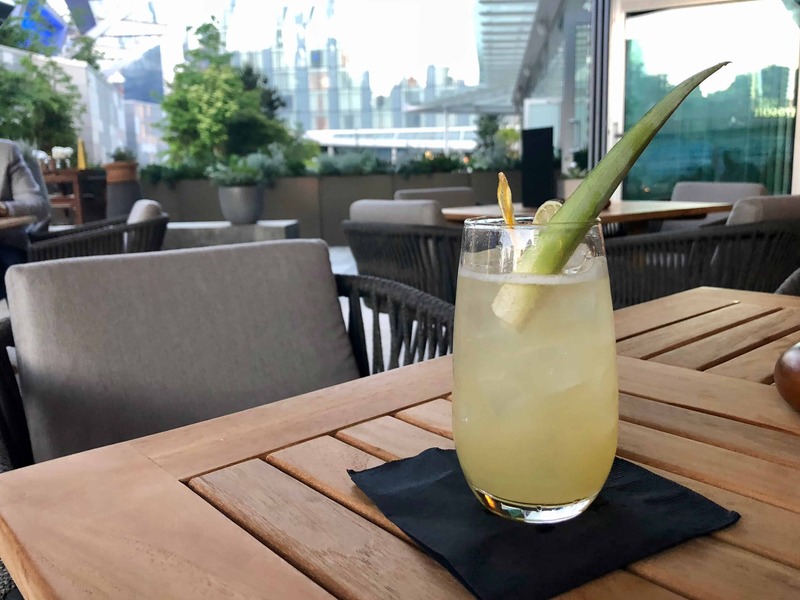 Parties of friends living up their Sunday-Funday, business partners relaxing after office hours, and couples enjoying their date night scattered throughout the gorgeous patio setting. A beautiful, bright smiled waitress came over giving the recommendation of her favorite cocktail options. Normally I’d just opt for my usual clean tequila soda but with the knowledge and help of our server, she explained to me even the juices in the handcrafted cocktails were freshly pressed. She suggested a cocktail that was right up my alley. Refreshing, not too sweet, filled with flavor, and something I could thoroughly enjoy, guilt-free. Each song better than the last, an overall fun, energetic vibe, and the unique atmosphere of this hidden gem supplied all the ingredients for a fantastic evening. A couple spins on the ol’ roulette wheel and I was off into dreamland in a bed that was consistent to all the other 5 star features of this hotel. 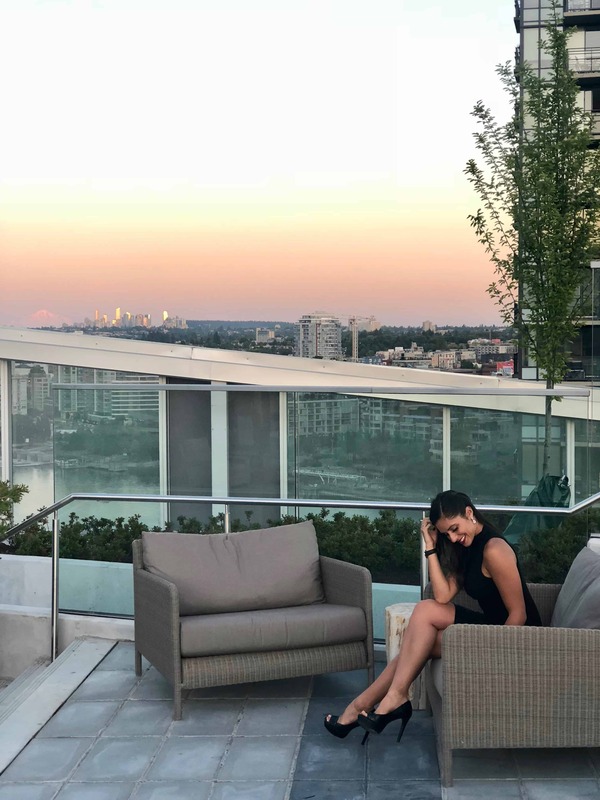 I woke up feeling rested, balanced and filled with gratitude to have been the recipient of JW Marriott Parq Vancouver’s invitation to experience their venue and health and wellness features first hand. 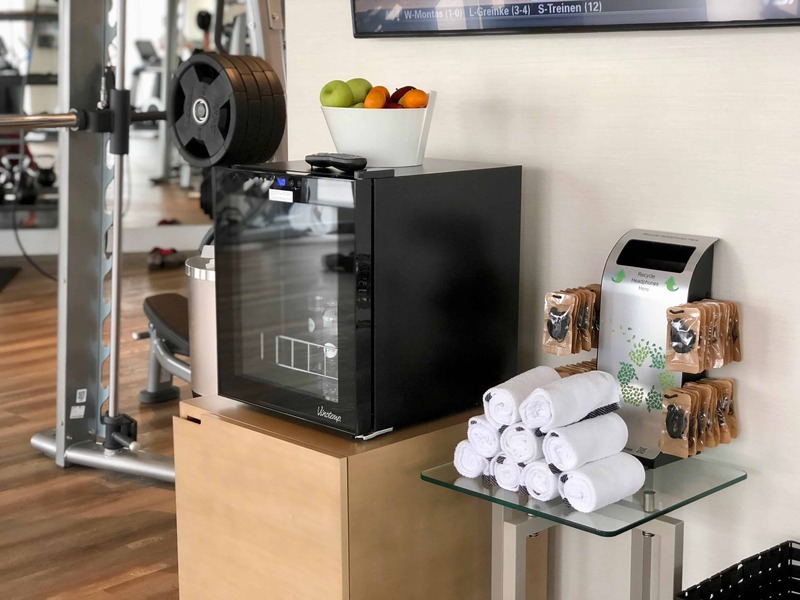 For someone who travels with their resistant bands, a cooler filled with clean snacks, and has been caught lunging down corridors multiple times, it is incredibly refreshing to see a leading hotel in its class making health and wellness one of their top priorities. 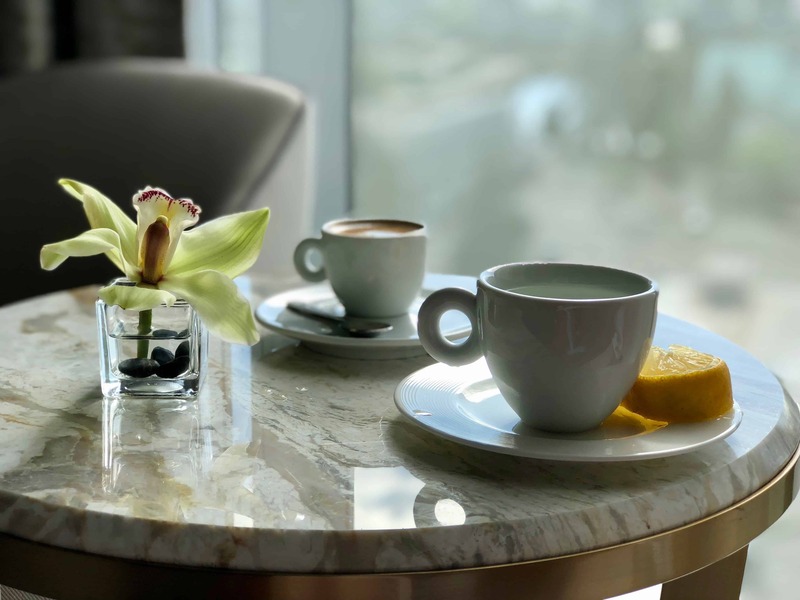 When traveling for business or leisure, there are so many things you have to think about especially when trying to keep on top of your wellbeing. 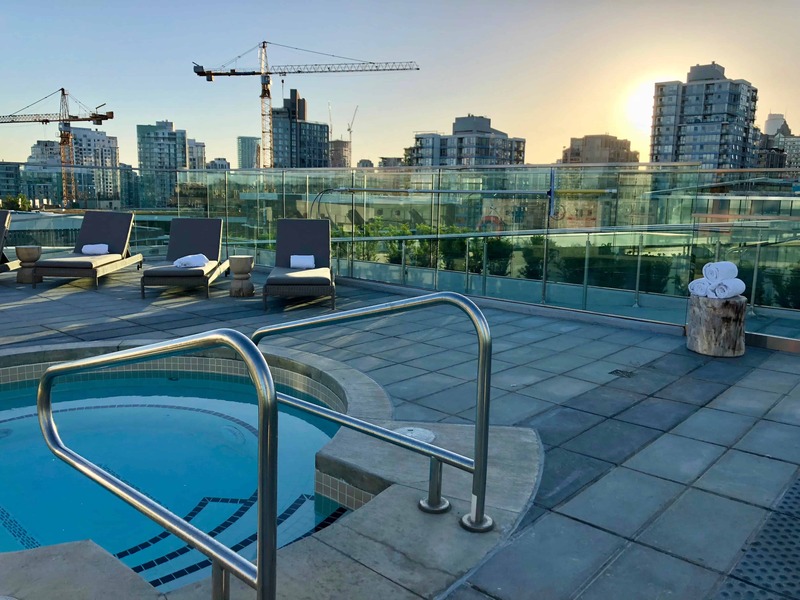 Since experiencing Parq’s brand new hotel in Vancouver, I can confidently tell you to pack your running shoes and forget the rest as they’ve got you covered. Now I’ve got a floral covered avocado toast and fruit plate to get to. See you here soon.